MAGNOLIA – Six professors at Southern Arkansas University received professorships for the first time this fall. The new appointments bring to 10 the total of named professorships on campus created by endowments through the SAU Foundation. Dr. Shawn Krosnick and Dr. Pablo Bacon were newly named as the L.A. Logan Professors of Biology. Dr. Lowell A. Logan, a native of Langley, and his wife, Cherry, had life-long involvement in education. After joining the faculty at Southern State College (now SAU) in 1967, Dr. Logan was the first SAU vice president of academic affairs. For his role in preparing students for the pre-health fields, Dr. Claude Baker was appointed as the first Larry J. Embree Professor. Dr. Embree attended SSC from 1950-1952, moving on to obtain his medical degree with high honors in 1957. Embree was instructor in neurology and assistant professor of neurology at Harvard Medical School. He was also professor of neurology and head of neurology for LSU Medical Center in Shreveport, La. A distinguished alum of SAU and of the University of Arkansas, Embree retired from full-time academia in 2006. Dr. Tim Wise is the newly-named Jean McFadden Turner Professor of Business Management. John and Jean McFadden Turner of Arlington, Va. are alumni of SAU and the first couple to fully endow a professorship through the SAU Foundation. 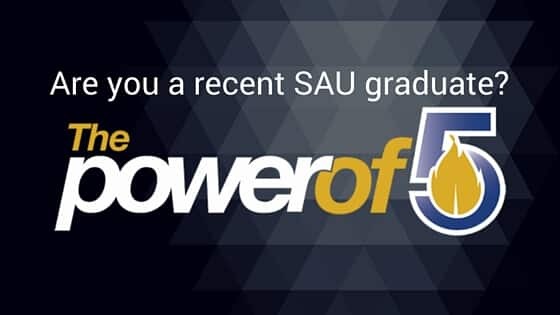 This professorship is designated for the advancement of the SAU School of Business Administration. A native of Lewisville and a Distinguished Alumnus of SAU, Jean McFadden Turner is a former president of the SAU Foundation Board of Governors.John Turner, a native of Camden and retired vice president at Georgia-Pacific, is also a Distinguished Alumnus and a charter member of the Business Advisory Council for the SAU School of Business Administration. Dr. Limount Zhao, associate professor of finance and chair of the Department of Accounting, Finance and Economics, was named the first Rankin Professor of Finance. The Rankin Professorship was created in honor of SAU President Dr. David Rankin by his former student James I. Freeman. A native of Magnolia, Freeman is executive vice president and chief financial officer of Dillard’s Inc. He received his bachelor of business administration degree from SSC in 1971. Freeman received a Certificate of Distinction for earning the highest grade in the state on the CPA exam and joined BKD, LLP as the youngest partner in the national accounting firm’s history. Assistant Professor of Economics and Director of the Center for Economic Education and Research Dr. Jennifer Logan received the Puterbaugh Professorship of Free Enterprise. This professorship was created in 1996 by a gift of the Puterbaugh Foundation of McAlester, Okla. The Puterbaugh Foundation was established in 1965 through the estate of J. Garfield Puterbaugh.